New stalls address important gestation and farrowing concerns, including pre-wean piglet mortality and sow comfort and appetite. 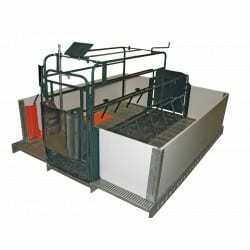 January 29, 2013 – Osborne, KS – Osborne Industries, Inc. has added farrowing pen and gestation stalls to their growing line of swine production equipment. The introduction of this new equipment ties into Osborne’s “Single Source Swine Solutions™,” an innovative line of swine management products, equipment and services for the global swine industry. New farrowing stalls by Osborne address the two major economic concerns in farrowing: pre-wean mortality and sow appetite. The layout of Osborne’s farrowing stall provides preferred laying areas for piglets to keep warm on Osborne’s Stanfield® Heat Pads. The layout also provides a way to keep piglets away from the sow, preventing crush loss. A recessed section of the creep area accepts specific sizes of Osborne’s heat pads so the pads remain flush with the surrounding flooring, giving piglets sure footing away from the sow. Sows are allowed to remain cooler due to the heat pad’s placement, which helps her increase feed intake and produce more milk for the litter. The flooring under the sow is comprised of a two-piece, self-supporting cast iron system that provides sows with stability and keeps them from slipping. Also, an adjustable rump bar allows for sizing sows and gilts; smaller animals can be kept toward the front of the farrowing stalls to protect piglets at the back end of the stall. Osborne’s new gestation stalls enhance sow comfort and allow easier access for farm personnel to perform routine tasks. The stall features a walk-through back gate and low back sides for easy breeding and pregnancy checking. The gestation stalls have no sharp edges and no floor straps for animals to lie on. Vertical rods at the front of the stalls reduce nose-to-nose contact between animals which helps minimize the risk of spreading infections or disease. The gestation stalls also feature standard feed pipes and horizontal top bars to further strengthen each stall in the row. The gestation and farrowing stalls are among Osborne’s newly released products, including nursery and farrowing flooring and steel penning, that were custom designed by Osborne engineers to increase efficiency in modern pork production. Osborne Industries of Osborne, Kansas, USA, is a 100% employee-owned company specializing in the manufacture and development of advanced livestock management equipment and turn-key services for the worldwide pork industry. For more information about Osborne and its innovative “Single Source Swine Solutions,” visit osbornelivestockequipment.com , or e-mail info@osborne-ind.com.